There are countless definitions of weeds. Farmers might have their own definition - a weed is any plant that interferes with profit, maybe? 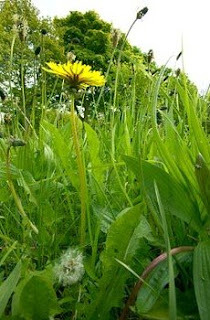 For gardeners, weeds are plants that are "out of place". A poets definition of a weed is "a plant whose virtues have not yet been discovered" (Ralph Waldo Emerson, again). The latest research shows that weeds benefit far more than crop or garden plants from the changes in CO2, making them more hard to control. In the future, we might all have to become poets in our attitude towards weeds. 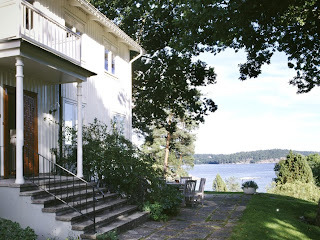 Just some nostalgic thoughts as I'm now separated from my garden in Saltsjöbaden (abstinence symptoms?). Our house was built in 1935. The exterior is more traditional in style, the interiors more "functionalistic", or "funkis" as the Swedes call this periods design style. My garden is typical for the thirties in Sweden (and even other parts of the world - more about that later). "Naturtomter" as this kind of lots are called in Sweden, were a very popular type of a garden during this period. 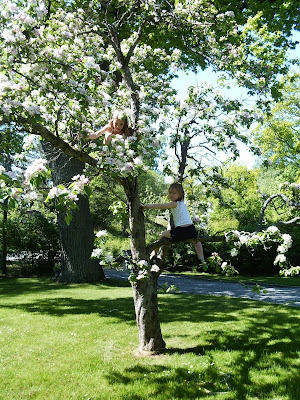 The ideal garden consisted of a "cultivated garden" near the house (above the lawn with an old apple tree towards the street), a place for outdoor dining and sitting in the sun, and a healthy place for the children to play outdoors. (This was very important in those days, when TBC still was a reality in Sweden.) The rest of the garden was ideally left as "nature garden" or "wild garden". This did not mean leaving it to it's own devices, but cultivating and refining the lot so that it would sit comfortably in it's surroundings. Adjusting the cultivated plants to the nature around and leaving many original trees and valuing them as great assets in the garden was part of the filosophy of this period, too. This kind of lots (gardens) were very much appreciated from the previous turn of century up to the thirties, and they still are, even if they are getting more scarce to find, at least near the largest cities. The first picture included above was taken before I started working with it "seriously", the other shows the meadow and cliffs towards the sea. I always cut a path through the meadow for better access to the beach below. On the other side, there are huge old oaks and lilac hedges, and flower beds nearest the house entrance. 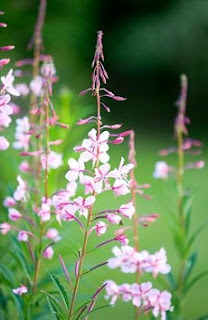 I think my garden is very special and very beautiful, but it makes huge demands in everything that I want to incorporate in the garden, both in form of time and in resources. Everything needs to be in large scale, otherwise it just seems fiddly and small. Of course, we are not talking about a farm or a manor house or anything on that scale. But as the oaks are huge (the largest has a diameter of 4.2 meters), and the view so long (kilometers of sea and islands), you need to think on the same "scale" too. 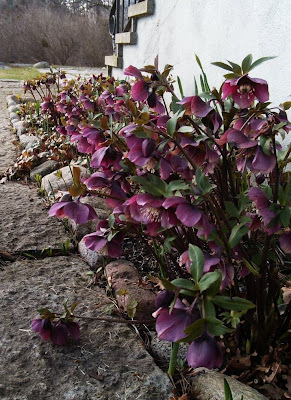 In my garden in Saltsjöbaden, I have made an enourmous effort in digging out weeds (ground elder end other nice stuff... above Hellebores that I digged up under a wirelike mat of ground elder roots) and cutting down overly mature shrubs. After that, I decided to keep the original plan and the limestone pavings. They are beautifully aged. I also renewed the flower beds in front of the house and planted some trees and a lilac hedge towards the neighbours (we only have one neihgbour, the other sides are protected parkland). Last year I cleaned up some of the cliffs towards the sea and planted draught-tolerant plants suited for this kind of surroudings. A picture of one of these cliff plantings is included below - with Polygonatum biflorum, Geranium macrorrhizum 'Spessart' and Armeria maritima 'Alba' mingling together. There is still a lot to do in this garden and maybe it is good for me to have a little break from it for a couple of years. Some of my plantings will mature during this time, and when we come back (if we do...), I will be able to see it with new, fresh eyes. It will always be important for me to keep the garden in harmony with the surrounding nature, but the ways to get there might just change a little over the years! I thought this little quote would fit perfectly today, as we are celebrating Midsummer, or the "Midsommar" and "Juhannus", an ancient Northern European celebration that marks the ancient middle of summer.